Nano Donate is a browser extension for Google Chrome which allows you to easily make Nano currency donations to participating websites. The website owner specifies the Nano donation address beforehand so you can just concentrate on making the donation. I own a website. How do I accept Nano donations through the Nano Donate extension? Nano donations sent through Nano Donate will arrive at the address you specify in the meta tag. If you need a Nano donation address download the Natrium mobile wallet, create a new wallet and then click the "Receive" button to view your Nano address. Depending on your website's architecture you could choose to specify a Nano donation address for your entire website or on a page-per-page basis. It's up to you! Once set up we recommend sending a few small test 0.0001 Nano donations to your own website to test that everything is set up correctly. Where do I download Nano Donate? Absolutely not! Nano Donate uses the Brainblocks payment processing service to process Nano payments, as well as support for scanning QR codes from your mobile wallet. Can I trust this extension? Full source code for Nano Donate is available on its GitHub page. Which websites are Nano Donate-enabled? 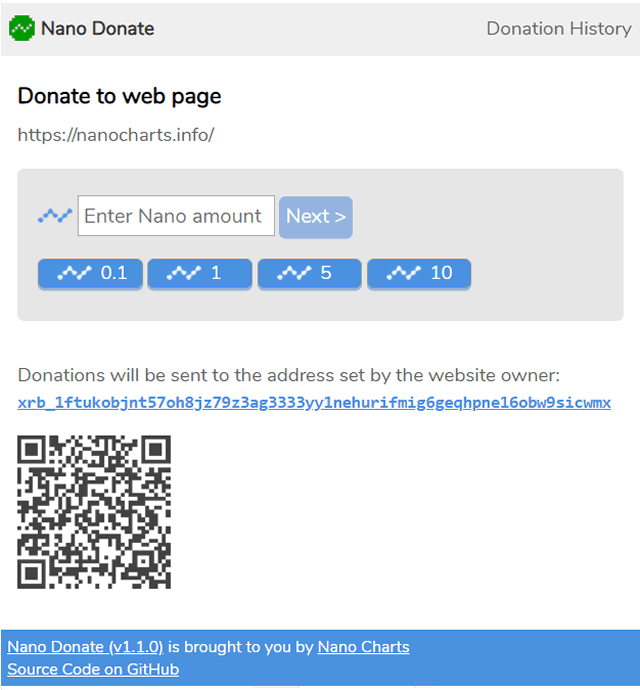 Nano Donate is brought to you by Nano Charts. By using this extension you agree that the author is not liable for any loss or damage arising directly through use of this extension.